This headphone adopts BT 5.0 technology, bringing high-speed data transfer, stable performance and low power consumption, offering real-time transmission of call and music. Dual moving coil drive units make the middle and high frequency more natural and bass stronger. With unique ring-necked design, no need to worry about its falling off. A built-in microphone enables hands-free calls, release your hands to do other things. Multifunctional buttons make it easy to control volume, songs and calls. * Adopts BT 5.0 technology, bringing high-speed data transfer, stable performance and low power consumption. * Dual 9mm moving coil drive units make the middle and high frequency more natural and bass stronger. * With unique ring-necked design, no need to worry about its falling off, perfect for sports. * Built-in microphone enables hands-free calls, release your hands to do other things. 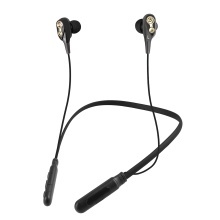 * Built-in 130mAh Lithium polymer battery offers you 4 hours of music palying time. * Three buttons make it easy to control volume, songs and calls.